My name is Ann Cameron. On Tuesday, July 30, 2013 I had a CT scan for malignant tumors in my lungs. I believe, from personal experience, that carrots can cure cancer rapidly – without chemotherapy, radiation, or other dietary changes. I think carrots are worth a try for nearly everyone diagnosed with cancer because the results show up very fast. On June 6th, I had surgery for a newly diagnosed Stage 3 colon cancer. I declined the recommended chemotherapy and felt better and better from that date. But six months later, on November 6th, I had a CT scan follow-up that showed probable cancer in my lungs. The oncologist said I had Stage 4 colon cancer metastasized to the lungs. Later, I learned that the colon cancer surgeon believed the cancer in the lungs was unrelated to the colon cancer – an independent development. His reasoning was that colon cancer, even metastasized, grows very slowly, and the two lung tumors were growing fast. The oncologist also said radiation wouldn’t help me. She recommended chemotherapy to retard my demise, but said chemotherapy wouldn’t cure the cancer. I asked the surgeon about my life expectancy. He told me that without chemo I probably had only two to three years to live – and not much more with chemo. I was very distraught. I read everything I could find on the Internet about alternatives to chemotherapy and radiation. I already had a list of 20 or so recommended substances that didn’t work, that my husband had tried for six months before dying of lung cancer in 2005. I hit upon a letter on the internet by a Californian man named Ralph Cole, saying that drinking the juice of five pounds of carrots, daily, had eliminated small squamous cell cancers on his neck. It also said that a few others had told him the juice had helped with a variety of cancers. Ralph was very detailed in describing his own experience, and wasn’t selling anything or engaging in self-aggrandizement. On November 17th, I started drinking the juice in the quantity Ralph recommended. Drinking carrot juice, unlike some supplements that oncologists prohibit during conventional treatment, is perfectly compatible with simultaneous radiation or chemo; but I didn’t want the recommended chemo because I had researched and dreaded its side effects. So, I had no chemo, no radiation, no other treatments, and no dietary changes beyond the carrot consumption, and continuing eating meat and ice cream and indulging in other dietary vices. I don’t recommend ice cream for cancer, but only want to emphasize that drinking carrot juice was the only change I made in my life, besides gratefully accepting prayers and “good energy” from friends and asking for wisdom and help from Whoever is up there in the Beyond. On January 7th, after eight weeks on the carrot juice (one quart to one and one-third quart daily) I had my first follow-up CT scan. It showed no growth of the cancer, some shrinkage of the tumors, and fewer swollen lymph nodes. In just eight weeks, the growth of the tumors had stopped. It’s interesting that eight weeks is the same amount of time on carrot juice that it took Ralph Cole to eliminate his squamous cell tumors. For the next six months, until the end of July 2013, I continued drinking the juice faithfully every day, except when I was traveling. I used an Omega Juicer at first, which made about one quart of juice from the five pounds of carrots. Because of moving, I switched to a Champion Juicer, which made about one and one-third quart from the same amount of carrots. Both juicers were effective. I made all the juice for the day in the morning, drank part of it, and kept the remainder in the refrigerator to drink throughout the day. Every month or so, when I traveled, I would go three or four consecutive days without juice. A CT scan at the end of March 2013 showed no growth of the cancer, no new cancer, no swollen lymph nodes, and further shrinkage of the tumors. A CT scan on July 30, 2013 showed no evidence of cancer! The swollen cancerous lymph nodes had returned to normal size and were stable. I told my oncologist, for the first time, about my carrot juice treatment, saying I hadn’t told her because I thought she would be skeptical. She said that she was sure that many natural substances are effective against cancer, but that she can’t recommend them because of the lack of formal studies and statistical support. My understanding is that MD’s must rigidly conform to recommending chemotherapy or radiation, and nothing else, lest they fly in the face of proven published research and cause a patient’s injury or death with unorthodox advice – which could get them a big medical negligence lawsuit. So, you can bring up carrots, or cabbage, or curcumin with your doctor, but even if they are interested, they are not free to to recommend these substances to you. My oncologist recommended a new scan in six months, but in six months I’ll likely be in Guatemala where a scan involves drinking a lot of a very nasty-tasting contrast medium. So, I’ve decided to wait a year to have the next scan. In the meantime, I will keep on with occasional carrot juice, and aim for less meat and ice cream, and more salads. -Two weeks after starting the carrots, there was no improvement. -Eight weeks after starting the carrots, the tumors had stopped growing and were shrinking. -Four months after starting the carrots, all the lymph nodes in my lungs had returned to normal. -Eight months after starting, there was no sign of cancer anywhere in my body. I believe that a newly diagnosed person, like me, still in generally good health, could safely put off chemotherapy for eight weeks to see if five pounds of carrots daily, as juice, will halt the growth of cancer. 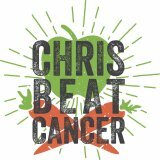 If the carrots work, one might continue postponing chemo as long as the carrots continue to arrest the cancer and, one hopes, eventually eliminate it entirely. My latest CT scan (July 30, 2013) proves that this has happened for me. The carrot cure also worked for Ralph Cole’s squamous cell cancers. I think they probably will work against a wide range of cancers. The effective ingredient in the carrots is falcarinol, which has been proven effective against cancer in lab experiments with rats and mice, done in Denmark and the UK. Using carrots or falcarinol, Dr. Kirsten Brandt and colleagues in the UK have retarded the growth of tumors in lab rats injected with a carcinogen, by a third. They have fed the rats and mice what proportionately in humans would be a pound and a half of carrots. Drinking the juice from five pounds of carrots daily, as Ralph and I have done, is a human equivalent dose more than triple what Dr. Brandt gave the rats. I hope that many people and organizations will help fund her work which, so far, has struggled to find strong financial backing. I love this! Way to go, Ann! Some health and healing cancer experts would probably view what Ann did as incredibly risky – only juicing carrots and not even changing her diet. But it worked! And hey, it’s hard to argue with results. Readers of this blog know that I recommend taking massive action and radically changing your diet and lifestyle to heal cancer, like I did. But Ann’s experience is encouraging evidence that sometimes small significant changes can produce big results. Read my post on how I juiced carrots to heal stage IIIc colon cancer after surgery here. Read how Ralph Cole juiced carrots to heal his squamous cell carcinoma here. In 2015, Ann wrote a book about her experience called Curing Cancer with Carrots.